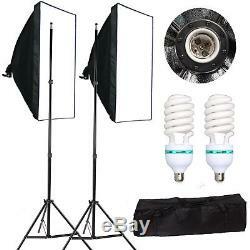 Photo Studio Softbox Continuous Lighting Kit Black Green White Backdrop Stand UK. 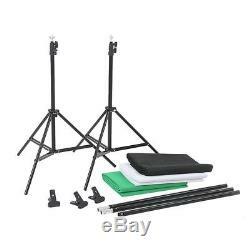 3 Backdrops+2x2m Background Support Stand. 1 x 1.63m Black Backdrop. 1 x 1.63m White Backdrop. 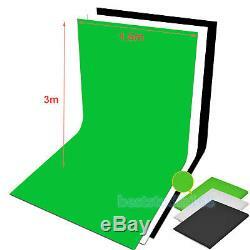 1 x 1.63m Green Backdrop. 1 x Carrying Bag for Background Support. 2 x 135W 5500K LED Bulb. 2 x 2m Studio Light Stand. 2 x Softbox with diffuser cover. 2 x 33 White Umbrella. 2 x 33 Black Umbrella. 2 x E27 Lamp Holder / Umbrella Hollder. 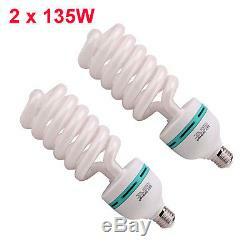 2 x 135W 5500K Daylight Light Bulb. 1 x 1.63m Gray Backdrop. 1 x 2m3m Background Stand. 1 x 60cm 5 in 1 Reflector Panel. 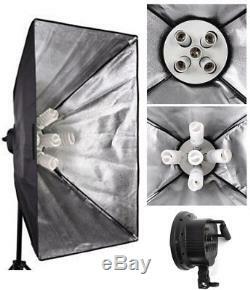 3375W Studio Softbox lighting Kit. 3 x 1125W Continuous Head Unit. 15 x 45W-5500K Fluorescent Bulbs. 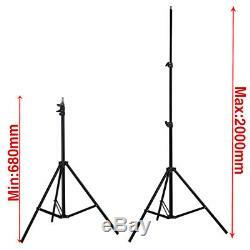 3 x 200cm Lighting Stands. 1 x 5in1 110cm reflector. 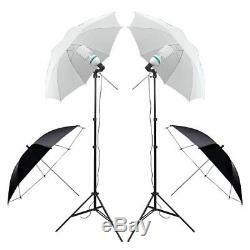 Function:To ensure the safety of your lighting equipment when in use and support all major photo equipment including reflectors, softboxes, lights, umbrellas, backgrounds and more. 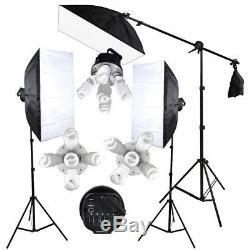 Solid safety 3 legs stages with locked system can hold light bulbs and umbrella and soft-box securely. Operation height of stand: 0.68m 2m. Height: 200cm / 6.56ft. Load: 4kg / 8.82lb. 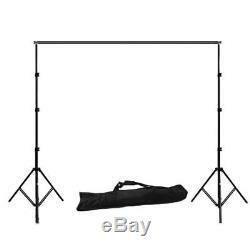 Function: To hold the backdrops and 23m/22m backdrop stand is lightweight, heavy-duty and extensible for both studio, outdoor and all occasions, extremely suitable for all level photographers. Type: Background Stand Crossbar Kit. Height: up to 2m / 6.6ft. Width: up to 3m / 9.8ft and up to 2m / 6.6ft. Package size: 85.5 17 11cm / 33.7 6.7 4.3in. Advantage: Cost less, easy to use, fit all the application such as movies special effects and photography, portable and foldable, to soak up all the light without reflective. Note: You can ease them use these ways when it comes to some creases. Use a wet towel to wipe the creases and then use a book to press it for a while. Roll the backdrop up and put it aside. High temperature steam iron is not allow. E 27 socket with UK plug. Foldable Softbox and detachable curtain. 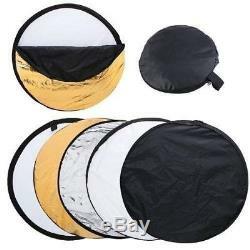 Softbox Adapter: Metal adapter to install rectangle, foursquare, quadrangle and octagonal softbox. Fuse: 5A (for your reference, refer to the actual product). Function: To give a better skin tone and contrast control and to soften, broaden and diffuse the light output of any tungsten or studio flash source. Material : Nylon materiasl, Aluminum shaft. Subtense Diameter: 33inch / 83cm. Function: To minimize light loss while maximizing light spread , allow about 50% transmission, provide a wide, even and soft illumination and give your camera the best performance and suitable for all studio flash. 1PCS 135W Fluorescent Light Bulb Equals to 675W regular incandescent light bulb output. Gives off a lot of light for the amount of energy they use 8000 hour life per bulb approx. Note:DO NOT touch the glass directly with your hand, use a clean cloth to install the bulb. Please always HOLD plastic part, NOT the glass part. 5500K 45W Day-light Energy Saving Light Bulb Equals to 225W regular incandescent light bulb output (Total 3375W Output: 225W x 15 Bulbs), Daylight Balanced Pure White Light, 90+ general colour rendering index (CRI). Gives off a lot of light for the amount of energy they use 8000 hour life per bulb approx Generates little heat. 1 Items are dispatched within. Special circumstances will be listed clearly in the listing. All light bulbs belong to Photo Equipments Kit, Aquarium Lighting Kit, Magnifying Lamp and other items with high attrition rate. Please do check everything carefully after you received the parcel, any the damage except DOA (Dead-On-Arrival) would not be covered if it's your fault. AbeststudioT is aluminum reflector, soft light, soft box, single and double lamp, three tripod, shooting table, iron cover, a rotating disk, a connector, a cantilever frame, a reflecting umbrella, vigorously clamp, photography lights, sandbags, flash, universal bricks and other products specialized production processing of the individual business. Abeststudio has a complete and scientific quality management system. Beststudio's integrity, strength and quality of products recognized by the industry. 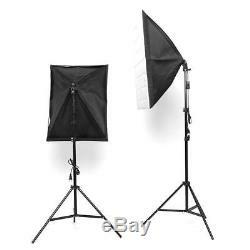 The item "Photo Studio Softbox Continuous Lighting Kit Black Green White Backdrop Stand UK" is in sale since Friday, October 12, 2018. 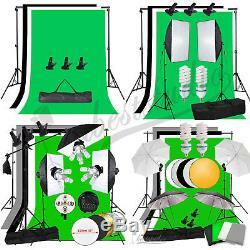 This item is in the category "Cameras & Photography\Lighting & Studio\Backdrops". The seller is "beststudio-uk" and is located in Leicester. This item can be shipped worldwide.